Browse a wide selection of luxury vinyl tile at our reputable and well-stocked flooring store. Luxury vinyl flooring is capable of emulating the appearance of a number of high-end types of flooring, such as hardwood and natural stone. That is what makes it an industry-leading alternative for homeowners who want an elegant look without the additional cost or maintenance needs. Whether you are looking for vinyl flooring that resembles natural stone, hardwood, or ceramic tile, our flooring store has what you want at an affordable cost. 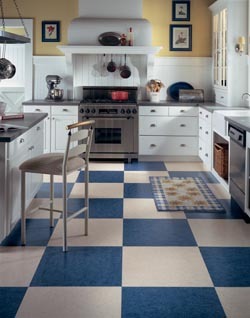 Top brands of this stylish and durable flooring option are a fraction of the cost of the high-priced styles they mimic. More and more of today’s homeowners are choosing luxury vinyl tile floors. The comprehensive selection of luxury vinyl flooring available from our store allows you to inject the right amount of classic appeal into your home while also updating its appearance. This affordable and resilient vinyl flooring option not only gives you the appearance you want at a lower price, but also prevents the moisture damage and warping that can be a challenge with more porous types of flooring. One of the most popular types of luxury vinyl flooring available from our store is vinyl plank flooring. This type of flooring replicates the appearance of traditional hardwood floors and features a variety of different wood grain levels and stains. Achieve the beauty of hardwood floors with handsome, low-cost luxury vinyl planks. Once you have decided that vinyl flooring is the right solution for your home, consider our professional flooring installation. Our trained team of vinyl floor installation technicians exceeds all of your expectations by expertly installing your new floor the right way the first time. For a reasonable price, you can rest assured that our trained technicians are installing your new tile or planks accurately and efficiently. In addition, your vinyl floor installation comes with our Ultimate Confidence Guarantee, which covers purchases and installs. If you are not satisfied within 30 days of your flooring installation we will replace it with a floor of equal value. Find out more about our industry-leading Ultimate Confidence Guarantee when you make your flooring purchase. Contact us when you are looking for an affordable way to add elegance and durability to any room in your home. Our trained team of floor technicians provides free estimates to customers living in Ardmore, Lone Grove, Dickson, Wilson, and Marietta, Oklahoma, plus all of the surrounding areas.